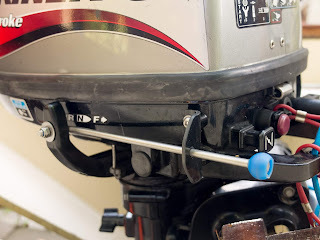 Many outboards have the gear control (forward/reverse) on the side, which is awkward to control and at crucial times you can find yourself facing backwards with the boat going forwards. Current designs feature a more conveniently placed control. Recently a friend pointed out that there are two fixing holes, which are used when remote controls are fitted. 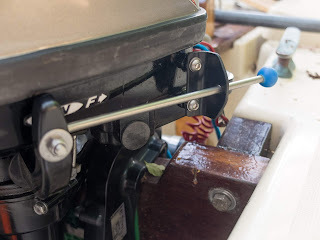 He also pointed out that other people had made their own control/extension to the gear lever. The solution here is quite simple, so should prove reliable - but the real test will come when its used on the water. It's made from a piece of 6mm dia. stainless steel, which has been bent to 90 degrees at one end and threaded M6. The guide/support is made from a piece of bent 3mm thick HIPs, which is attached by two 6mm machine screws. Note : The lower M/S does need to be cut accurately to length.